When I was younger my dad required me to read, 7 Habits of a Highly Effective Teen, by Stephen R. Covey. He of course, read it as well, and continually lectured me on the importance of the 7 habits. As I got older, and my dad finally assumed I encompassed those 7 habits, I became liberated of the daily references he made to Covey’s book. However, I should’ve known better, Covey reappeared when I began college. As I faced deadlines, a constant flow of emails, and meetings as any usual employee or college student, I found the saying “Time is of the essence,” is in fact, spot on. There are only so many hours in the day I can mark tasks off my list no matter how late I try and stay up or ea rly I drag myself out of bed. Once again, my dad began persistently referencing Covey as a solution to my lack of time. 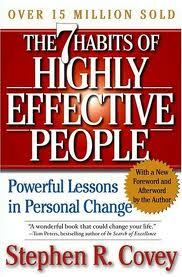 Only this time, he referred to Covey’s adult version of the 7 habits- 7 Habits of a Highly Effective Person. Due to I am not the only college student or employee facing the crisis of time management, I decided to for once, listen to my dad and Covey’s advice. Therefore, today, I want to give credit to Stephen R. Covey’s time management method which all people may prosper from – Habit 3 Personal Management. Many methods of time management exist- checklists, calendars, and prioritizing our daily tasks. One method Covey recommends which you may find more effective in the workplace and in your daily home life is a matrix of quadrants of importance. 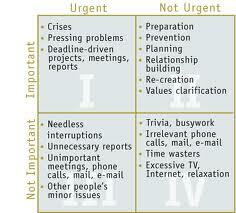 In the matrix, the key to time management comes from Quadrant II. If Quadrant II activities are done on a regular basis, you will find a tremendous improvement in your daily life. The time for Quadrant II activities comes from Quadrant III and IV. Covey believes that effective people do not spend time in Quadrant III or IV because such activities are unimportant to your goals in life. One must find time to take on Quadrant I because procrastinating this quadrant results in the task getting bigger and bigger until you must deal with it. Relatively, Quadrant I will shrink with attention to Quadrant II as well with practice of classifying activities. Classification of quadrants requires: 1. Prioritization 2. Organization of priorities, and 3.Self- discipline. However, always be careful of confusing Quadrant I and II. A critical skill for time management also requires delegation. Being able to effectively delegate tasks to others is highly important in the workplace when dealing with time management. Delegating allows you to devote your time to higher quadrant activities while enabling personal growth for other individuals. I truly recommend utilizing or at least trying Covey’s personal management method to help you put your responsibilities into perspective. Performing time management and following Covey’s quadrants of importance will allow you to create a life congruent to your goals and values. For example, by following Covey’s method I managed to find time to write this blog! This entry was posted in General, Tips & Tricks, Uncategorized and tagged Stephen R Covey, Time Managment on June 27, 2012 by Bloomington Chamber Staff.